I was hoping to ask you guys some solid advice on what dog food to feed Peanuts. I've decided to switch her to dog food because of its convenience. She still drinks milk during noon time but I'd really want to do away with it. So, I went to this Agricultural Supply as they were selling dog food and asked them what most dog owners buy from them. 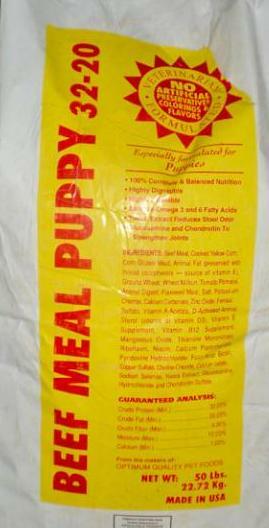 The nice sales lady said Optima Beef Puppy Meal was the one mostly sought after. When I gave a piece of kibble to Peanuts, she ate it up signifying that she does like it. I also added a spoonful of it in her dinner and she enjoyed it too much. Now, here's the problem. As I was searching for information on its primary ingredients, I come across the 2008 recall of US-made Optima sent to China. During such year, multiple dog food companies recalled their products due to aflatoxin ( which was as you've guessed it, guilty of killing more than 30 dogs during such time). Here are two references I've read. I was unable to search for the specific article because my eye was acting up again. Any thoughts or recommendations? Although I will be giving here meat and rice like the usual, I want to have the dog food option. Thanks in advance. pyridoxine hydrochloride, folic acid, biotin, copper sulfate, choline chloride, calcium iodate, sodium selenite. Thanks for the advice. Originally, I would always use Pet One Puppy, but I haven't found any sold in the grocery store.It's so weird. And I know what you mean about dog poisoning, it drove me a little paranoid last night that I had to go to the shop were I bought it this morning, just to ask when it was manufactured. My mom recently switched me back to Canidae. It's all natural and I really love it! Just to let you know too about your question on the suasage race in one of my posts :-) It is where lines of small sausages are laid out in rows and standing at one end of the line the owner holds the dog until the signal is given and then the dogs are released and the one who eats their way along the line of sausages fastest is the winner. I think the prize is in the race itself as the dogs go wild for the sausages and don't care who wins. It is always very popular with the dogs and makes everyone else laugh! We feed Fred and Gloria The Great Canadian dog food. http://thegreatcanadiandogfood.ca/ Family owned, made right here in Canada. They work with local farmers for the best ingredients. I just don't know if it's available in the U.S. Good luck! It's great that you're doing lots of research to make sure you get the right food!! Like Magic said, my Mum has used James Wellbeloved when she lived in the UK, but couldn't get it here in the States. She found a Grain Free kibble with no by-products for me from Costco, but I'm not sure if you have that store? Yikes...wish I could help you out...I can only have Hills Prescrition due to pancreatitis and it gets very boring. Wow! Scary stuff! To be honest after reading so many things coming from China are toxic, I took the advice of only buying USA only dog food and treats. Since I only will feed Yuki and Rocket US made food, I have included a link. I made my decisions based on this site. I used to feed my dogs Blue Buffalo Wilderness, it's rated a 5 star dog food. But when I found Castor and Pollux Organix was also rated 5 star, and that I could get it for about $7 less than Blue Wilderness, I switched. Even though dog food is regulated here in the us, it's still not very strict. In the one star dog food, it can include animals of already dead, dying, or diseased animals. Gross right? Its the reason I go for the all natural more expensive healthy stuff. I think my dogs health is worth it. @Pip: Thanks, Pip. I wish I could find that in our country but we only have Pedigree, Alpo, Eukanuba, Holistic, Pet One and more. But I'll try to look for Canidae. @Magic: Oh, that's awesome. I bet I'd be laughing out loud while watching them schnauzers trying to eat all the good smelling sausages. @BM: Unfortunately, I'm from the Philippines, BM. Which makes the chances of the Great Canadian dog food even lesser because of the location. @Snoops: Thanks Snoops. We don't have Costco here and what makes it worst is the reason why I hardly but food in Petshops here is because they charge 10% -20% higher than its price in Agricultural centers. @Scrappy. Poor dear. Don't worry, your mommy just wants you to have the best for her little darling which is why boring is good ^_^. @Nola: Yes, I've considered that too. I'm still going to add cooked meat in Peanuts food because nothing beats the real thing. @Meowmeow: True. Sometimes, you can't help but wonder why they're given licenses to manufacture in the first place. @Y&R: That's the thing, Y&R. That Optima food that was recalled was US-made. Addie's death was more devastating because Ryan went for US-made dog food but still she got poisoned. I'm glad I was able to respond to everyone. My eyes are still really acting up. I haven't worked on my other job for nearly a week now. I hope to get better soon. After reading this, this scares me very much! I feed my dogs human quality meat. I look out for specials, and buy chicken wings, chicken drumsticks, and anything else on special. Unless toxins start appearing in human food, I feel pretty safe. I agree with a previous poster. Three of the top four ingredients in this food are grains/soy, and that is not what a dog needs. I'd suggest looking at the labels and finding something with meat first. Just keep in mind that the more corn in the food, the less healthy the food is for a dog. woo woo woo! Thanks for the advice. Originally, I would always use Pet One Puppy, but I haven't found any sold in the grocery store. It’s so weird. I review many sites about dog foods but I didn’t found any site which include recipe how to make dog bones. Please discuss about that. This happened in 2009. i'm sure they did something about it. Usually issues like these would alert the manufacturer on their safety standards.